1 Have you ever looked up at the moon and wondered what it was like up there? People have looked at it for thousands of years wondering about it. Some said it was made of green cheese, while others worshipped it as a god. By the twentieth century, many people decided it was time to find out exactly what was on the moon. 2 In the late 1950s the space race began between the United States and the USSR. At first, the Soviets were ahead. They had sent a dog and a man into space. They won the race in the first step, but who would win the second part - to put a man on the moon? 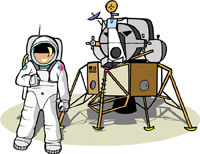 3 In May 1961, the Apollo program was announced by NASA. It was the job of the NASA scientists to decide who was going to take part in the space missions and to figure out how they would get to the moon.